Ahram Online declares its full support for the strike action undertaken on Tuesday by a large number of major Egyptian newspapers and TV stations in defence of freedom of the press, freedom of expression, civil liberties and the rule of law. In view of our particular status as a web-based news outlet, however, we will maintain our updates throughout this crucial day of protest, not in contravention of the strike action, but in full solidarity with it. These decisions were consensually adopted by an all-staff meeting of Ahram Online, and in consultation with members of the board of the Press Syndicate and striking news media. Hundreds of journalists gathered outside the Egyptian Press Syndicate in downtown Cairo on Tuesday afternoon, waiting outside the syndicate for half an hour before marching to Tahrir Square to declare their objection to the controversial constitutional declaration which was passed by President Mohamed Morsi two weeks ago. The march was also protesting the articles in the new draft constitution that will be put to referendum on 15 December, which they believe will negatively affect freedom of press and expression. "It’s a long fight and we know this," Abeer El-Saady, a member of the syndicate board told Ahram Online. "It is not up to the journalists to quit this fight or to lose hope that they can win, as it is not only their rights they are fighting for. It’s the right for people to know," she added. The press syndicate board on Saturday issued a statement rejecting the draft constitution, saying that they will take disciplinary measures against "those journalists who disobeyed the syndicate's decision to withdraw from the Constituent Assembly” in reference to syndicate chairman Mamdouh El-Waly, who attended the constitution-drafting body's last session which passed the controversial draft of the national charter. Journalists chanted against El-Waly at the protest, saying that he no longer represents them. "Everything is possible in the coming days but the only thing we can say for sure is that journalists will not give up their fight," Gamal Fahmy, the deputy chairman of the syndicate board told Ahram Online. "We are part of a wider movement against the constitution and every sector will reject it for its own reasons, but we all agree on one thing which is rejecting the shameful constitution and trying to stop the referendum." Fahmy added that out of seven articles suggested by the syndicate, none was included in the final draft. "They gave us the right to issue papers by notification but on the other hand they put an article that gives them the right to close any paper if they want to. Is this the kind of freedom we are looking for?” he added. On 20 November, the syndicate announced its withdrawal from Egypt's Constituent Assembly, citing the assembly's refusal to listen to the syndicate's recommendations. The council criticised what it said were violations of freedom of expression in the current draft constitution. Moreover, it criticised the assembly's disregard for journalists' demands to protect press independence, and to prohibit the closing down of media outlets and the withdrawal of newspaper editions. The march called for by the board comes on a day when more than 12 independent and partisan newspapers are on a one-day strike to object to both the recently-issued constitutional declaration and the draft constitution. On Wednesday at least five television networks will transmit blank screens to send the same message of discontent. A number of news websites have also responded in a variety of ways to the media strike. Egypt Independent, Al-Masry Al-Youm's English news website, has completely halted work and covered its main page with a statement reading "You are reading this message because Egypt Independent objects to continued restrictions on media liberties, especially after hundreds of Egyptians gave their lives for freedom and dignity." 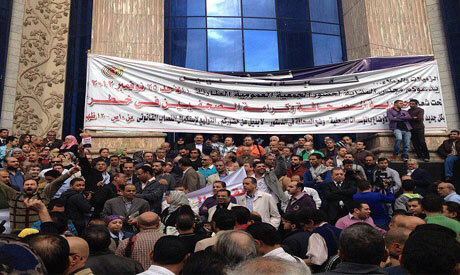 Al-Masry Al-Youm daily newspaper is amongst the 12 newspapers that have gone on a one-day strike. Masrawy expressed its solidarity by changing its news website to black and white. Daily News Egypt has added a logo to its website with the words "Tuesday Press Strike … No to Dictatorship." Members of the Al-Ahram Arabic website went on a partial strike on Monday and released a statement in solidarity with Tuesday's press strike. Ahram Online will only be publishing news about the strike and protests against the constitutional declaration and constitution. Work was halted at the site between 1:45pm and 3:45pm to allow journalists to participate in the press syndicate march to Tahrir Square. You do not even deserve democracy, Mubarak is still alive, chose him again. Mr. Morsy is for civilized people. The Journalists and the opposition in general have no real issue. They just don't like the Islamists. Otherwise, the constitution draft is nearly perfect and contains no injunctions impeding press freedom. One must learn to accept losing and gracefully in a democracy. You get to vote and once that is over you accept the verdict and move on. Give the ther side a chance to govern and if they fail you get your chance next time and may be have your way. I understand it is not winner take all but the draft constitution is a good start for Egypt. There will be time to offer amendments.